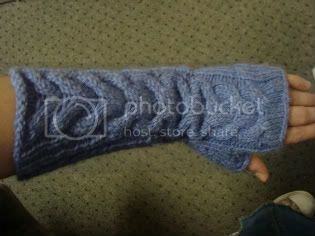 joanofdark.com: Bella's Arm Warmers (an actual knitting post)! Bella's Arm Warmers (an actual knitting post)! I know, I know! Actual knitting content on my knitting blog! What is this world coming to? 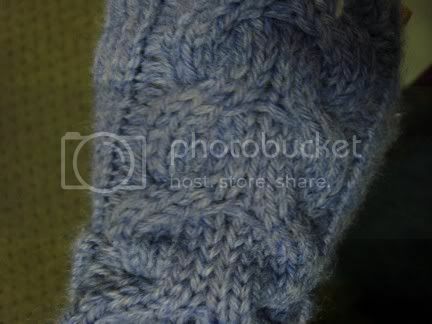 I wanted to make the mittens Bella wears in the Twilight movie, and the awesome Subliminal Rabbit created the pattern! And remember that lovely yarn I purchased at Mass Ave Knits "just because"? I got to put it to good use! Now, since the Cascade 220 I used wasn't as bulky as the yarn called for in the pattern, I had to mod the pattern a tiny bit to get them slouchy. I just did the cable repeats a few extra times, and cast on a couple extra stitches at the beginning. Once I finished the first mitten, I realized... I didn't want a mitten! It's spring, I wouldn't be able to wear it until winter... and I am an instant gratification kind of gal! So I ripped it back, and turned the mittens into arm warmers. I absolutely love them! The yarn is soft, and they're perfect for these slightly chilly mornings! Great job making them over. And thank you for the link. I wish I could see the pics...damn content blocker at work...I wonder if you've put it on rav yet..I'm going to look. i'm a regular reader. and now a flattered gal. great job and great mod!